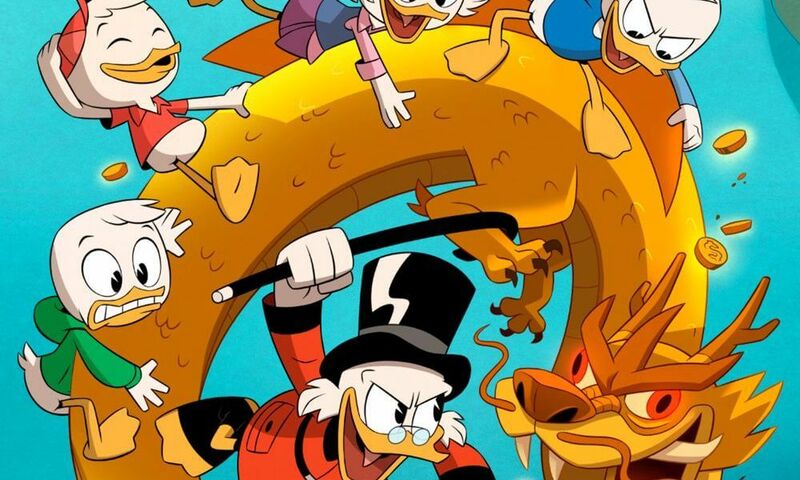 Our happiness knew no bounds when we heard “DuckTales” the iconic cartoon series of the 90s making a comeback in a revived and rebooted form. The season premiered on 12th August 2017 and has started making waves already. The story is also the same, revolving around the super-rich Scrooge McDuck, who is reunited with Donald Duck after ten long years. What follows in series of adventure and treasure hunting expeditions. We haven’t got our hands on Disney DuckTales 2017 edition coloring pages yet. However, we’ve compiled some cool Ducktales coloring pages from the earlier version for the diehard fans of this series. This coloring page features the amazing cast of Ducktales. It includes the one and only Scrooge McDuck, Launchpad, Huey, Dewey, Louie, and he adorable Webby. The coloring page is pretty detailed with the background of Duckburg behind. And don’t miss filling colors in the dollar bills, diamonds and crown. Meet Scrooge McDuck, the wealthy, miser, but hugely popular Disney character and the protagonist of DuckTales. Scrooge McDuck, fondly known as Uncle Scrooge, is the wealthiest duck in the world, a title earned from years of hard work and dedication. He has toured some of the most exotic parts of the world just in search of wealth and treasure. And this again, he’s making an appearance after a hiatus of ten years. In this coloring page, he’s shown teaching math to Donald Duck. 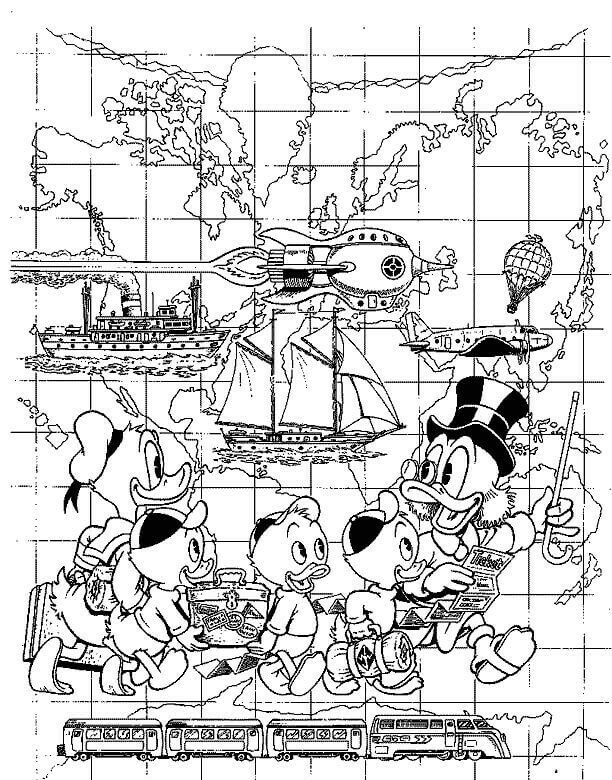 This coloring page features the central characters of DuckTales on the map of Duckburg. This fictional city, which happens to be the residence of Scrooge McDuck, Donald Duck, and Huey, Dewey and Louie, is location in Calisota, which is also a fictional state. Duckburg was a small and quaint town until the arrival of Scrooge McDuck, who established several businesses in and around the city. Here’s a coloring page of Huey, Dewey, Louie. The triplets are all grown up now, but this coloring page is of when they were young and extremely mischievous. Huey, Dewey, Louie do not just look identical, but have similar personalities as well. Surprisingly, the triplets even have rivalry amongst them. Here’s a coloring page of the Beagle Boys, a gang of criminals who always attempt to rob Uncle Scrooge. In DuckTales Comics, the Beagle Boys are identified by their prison tags, which appears on the chest of their t-shirts. 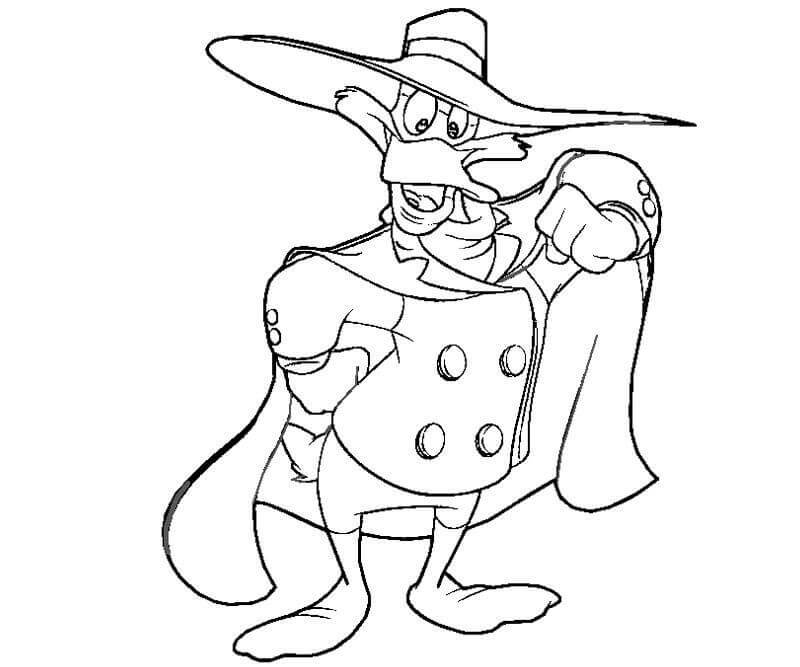 Darkwing Duck is one of the most badass characters in the DuckTales series. He’s a cross between Donald Duck and Batman and his costume is similar to the character Shadow from Pulp fiction. She’s a slender duck with orange bill and feet, white feathers and black eyes. He appears wearing a purple costume. Dewey, the second born wants to stand out because he’s the middle child. He has taken up Uncle Scrooge’s intelligence in the 2017 series. Huey, the eldest child, is the most responsible of all the triplets. In the 2017 DuckTales, Huey takes up Uncle Scrooge’s intelligence. Meet the handsome pilot of Duckburg, Launchpad McQuack. He’s Darkwing Duck’s sidekick and Scrooge McDuck’s pilot in the series. This lovable doofus is a lovable character, despite being absent minded and making several mistakes. He’s gentle, charming and also witty. 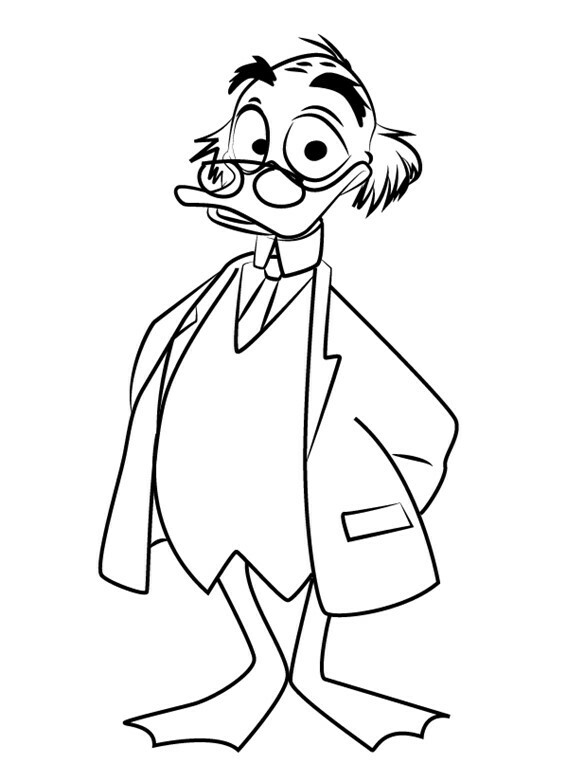 Here’s a coloring page of Ludwig Von Drake, the brilliant, but eccentric scientist who happens to be the uncle of Scrooge McDuck. He has a vast array of knowledge on a wide variety of subjects. Professor Ludwig has obtained degrees from renowned universities, like Heidelberg, Oxford and Cambridge. Here’s a coloring page of the super adorable Webby, the granddaughter of Bentina Beakley whom Uncle Scrooge loves even more than his own nephews. Webby is no longer the shy and demure girl as she was previously. She’s now a smart and confident girl, ready to take everything that comes over. But one thing that still remains is her love for animals. She’s shown to tame even the most dangerous animals, such as dinosaurs. This coloring page shows Magica De Spella making spells, probably to attack Scrooge McDuck. This evil sorceress, living on the slopes of Mount Vesuvius, has just one aim and that is to steal Scrooge McDuck’s One Dime. She wants to melt the One Dime in the volcano fire so that she can turn into a magical amulet. Here’s a coloring page of Baggy, one of the Beagle Boys. You must be wondering how we recognized him? It’s from his placard number, 617-716. And do you know why he’s named Baggy? Because he wears loose clothes and has a dopey smile on his face. Baggy is considered the least intelligent out of all the Beagle Boys. 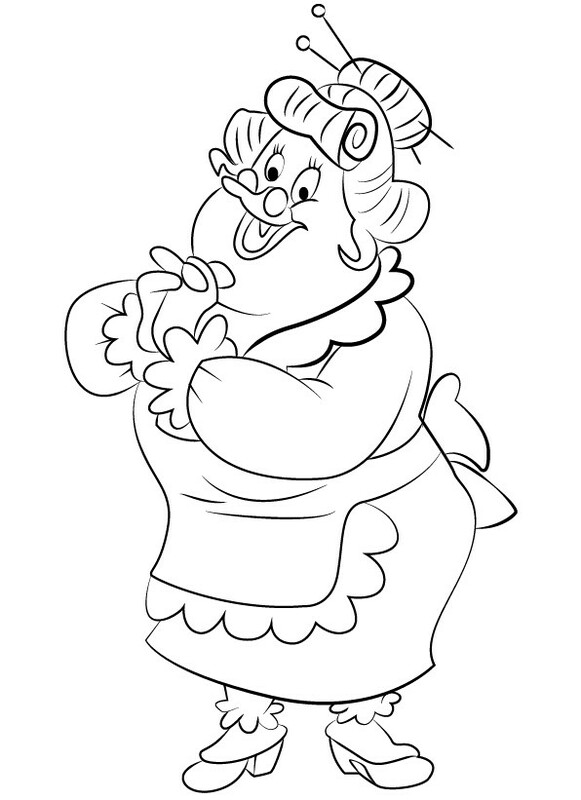 Meet the adorable and big boned Mrs. Bentina Beakley, a recurring character in DuckTales series. She’s Scrooge McDuck’s maid and cook and the nanny and mother figure to the triplets. She’s often seen scolding the boys and trying to keep them away from misbehaving. Mrs. Bentina Beakley also has an adorable granddaughter names Webby, who lives with her in the mansion. Meet Gyro Gearloose, the most famous inventor of Duckburg. The only catch is that his inventions do not work the way he wants them to be. But what sets him apart is his enthusiasm for learning and creating something new, even though his inventions sometimes cause trouble to Scrooge McDuck and Donald Duck. We find this coloring page incredibly cute because it features Uncle Scrooge making a wooden house, probably for Webby. Years of staying aloof and alone made Uncle Scrooge bitter and heartless. But the younger ducks, namely Huey, Dewey, Louie and Webby gave him a new lease of life. They changed Uncle Scrooge so much that his family is now more important to him than money. 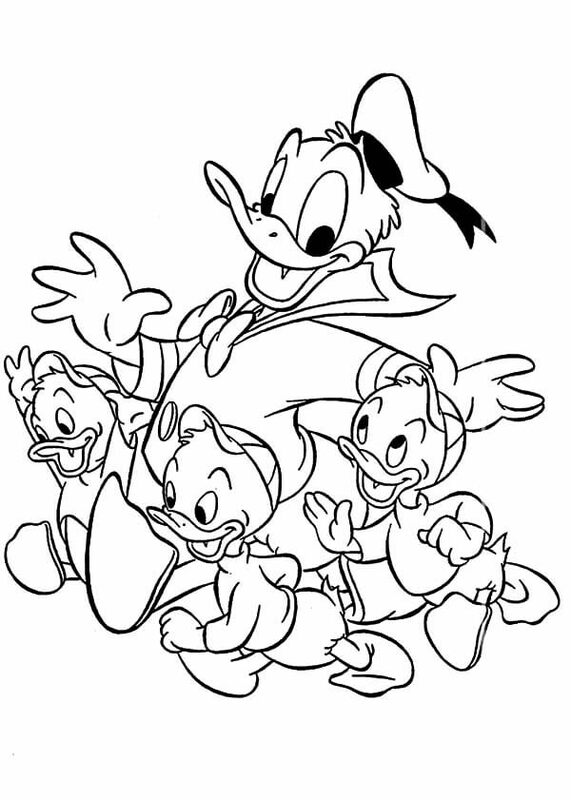 Here’s a coloring page of Huey, Dewey, Louie with their uncle Donald Duck. This troublesome and slightly craft ducklings create problems for Donald Duck in every way possible. The kids may take revenge or retaliate on their uncle, but they even help him and Scrooge McDuck in adventures. This coloring pages shows Gyro performing some experiment, probably with the help of his assistance, Little Helper. Little Helper, or helper as he is better known, is a small robot with a light bulb on his head. He’s also seen wearing a thinking cap, which is basically a nest with three birds living in it. This coloring page shows Webby flying away with the balloon. Webby may have become all smart and sassy, but we all will definitely miss the old, adorable, emotional and affectionate little duckling. Do you remember Quacky Patch, a small stitched doll, which she used to carry with herself all the time? Here’s another coloring page of Baggy, but this time with a halo above his head. He’s even seen carrying a bag of stuff, which he probably looted from somewhere. Baggy also faces problem in communication and can stumble over the words and say wrong things, making it difficult for others to understand him. Here’s a coloring page of Huey, Dewey and Louie playing in the pond with frogs. Coincidentally, all three of them have found a frog to play with them. And it seems that each of them are trying to imitate the frogs they’re playing with. Did you notice Louie taking a dive like the frog? This lovely coloring page shows Uncle Scrooge playing seesaw with his favorite toy, a bundle of money. Uncle Scrooge spent so much time accumulating and expanding his wealth that he became of cheapskate. He is incredibly possessive of his fortune and rarely spends more than required. We’ve always loved seeing him swim in his ocean of money. Too much of money can create inconvenience and this coloring page is a perfect example of it. Uncle Scrooge has so much money that he has to hide them in his hat. But it seems that his hat isn’t cooperating with him this time and all the money is kind of falling out. 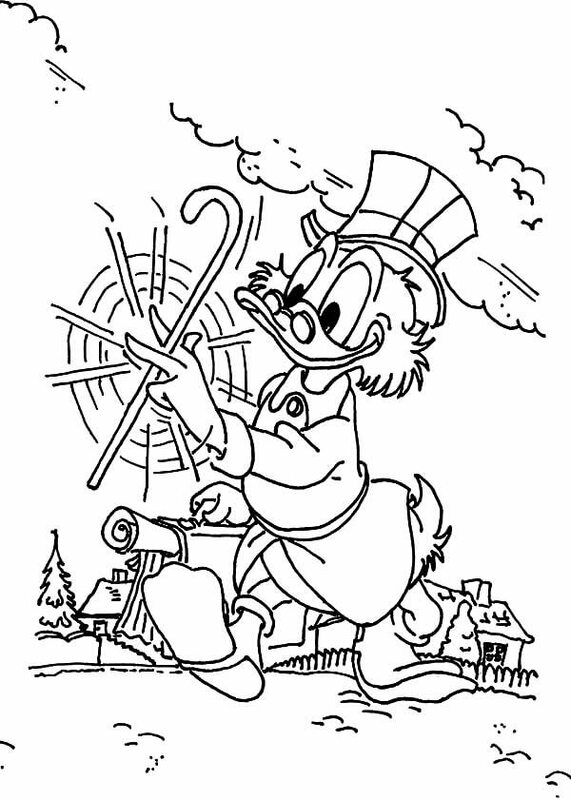 Uncle Scrooge looks immensely happy and jolly in this coloring page. He’s probably walking towards home carrying his briefcase and spinning the walking stick. It seems he cannot wait to reconcile with his most precious possession, his money. 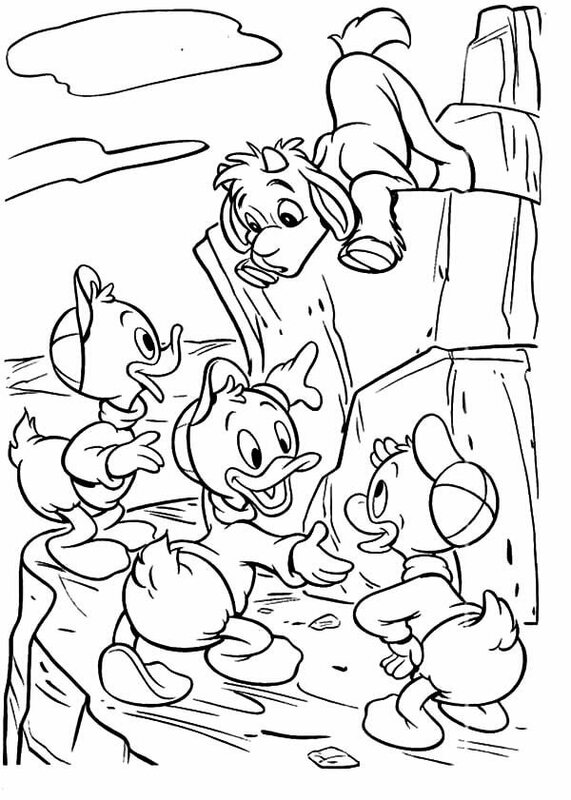 This is one of the most adorable Ducktales coloring pages in our opinion. It captures Huey, Dewey, and Louie amazement on seeing a goat. It appears like the coat is caught in some trouble and the triplets are looking for ways to help it. So these were the best Ducktales coloring pages of 2017 for you. These aren’t the latest Ducktales coloring pages, but we promise to update the article with 2017 Ducktales coloring pages as soon as get them. Until then, happy coloring.